The colonial town of Cienfuegos was founded in 1819 in the Spanish territory but was initially settled by immigrants of French origin. It became a trading place for sugar cane, tobacco and coffee. 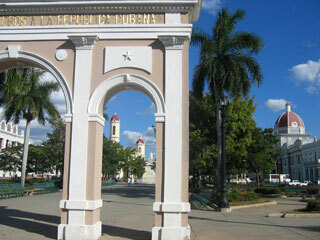 Situated on the Caribbean coast of southern-central Cuba at the heart of the country's sugar cane, mango, tobacco and coffee production area, the town first developed in the neoclassical style. It later became more eclectic but retained a harmonious overall townscape. Among buildings of particular interest are the Government Palace (City Hall), San Lorenzo School, the Bishopric, the Ferrer Palace, the former lyceum, and some residential houses. Cienfuegos is the first, and an outstanding example of an architectural ensemble representing the new ideas of modernity, hygiene and order in urban planning as developed in Latin America from the 19th century. This article uses material from UNESCO World Heritage List article "Historic Centre of Cienfuegos ", which is released under the Creative Commons Attribution-Share-Alike 3.0 IGO License.